Visual concepts for widths, buffers and other characteristics of bicycles, motor vehicles and the roadway. Click each image for a larger view. The above bicyclist operating space does not take into account bicyclist speed. In a future graphic we will discuss how increased speed requires increased operating space. 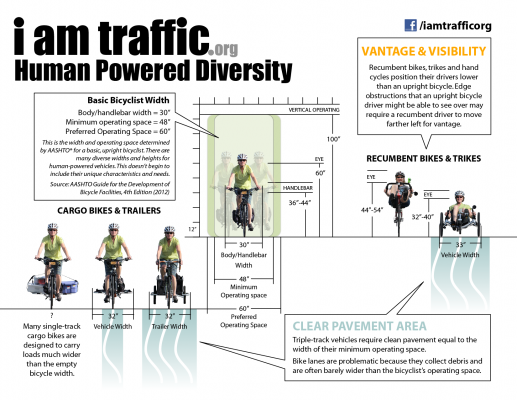 It also does not take into account the diversity of cargo bikes, trailers and trikes. That is the subject of the graphic in tab 2. This is a small sampling of human powered vehicles. Not shown here are quadracycles, hand cycles, velomobiles. Width is only one dimension of the diversity. Length effects operating characteristics, like turning radius. In addition, some styles of bicycle are designed to go fast with relatively little effort. 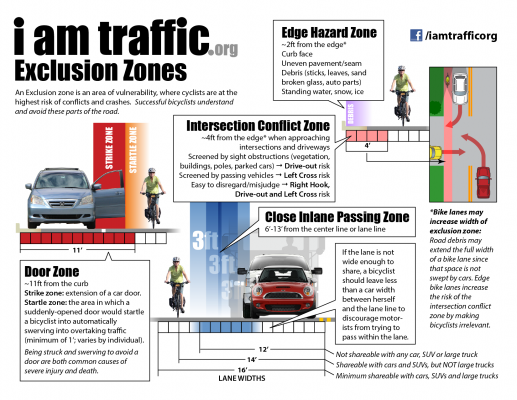 Exclusion zones, developed by Dan Gutierrez, are one of the most important concepts for successful bicycling and designing facilities which support it. Bicyclists should not be directed, by law or by design, to operate in any of these exclusion zones. INTERSECTION CONFLICTS To achieve vantage and be visible to other drivers, bicyclists need to be farther left than an edge bike lane allows. 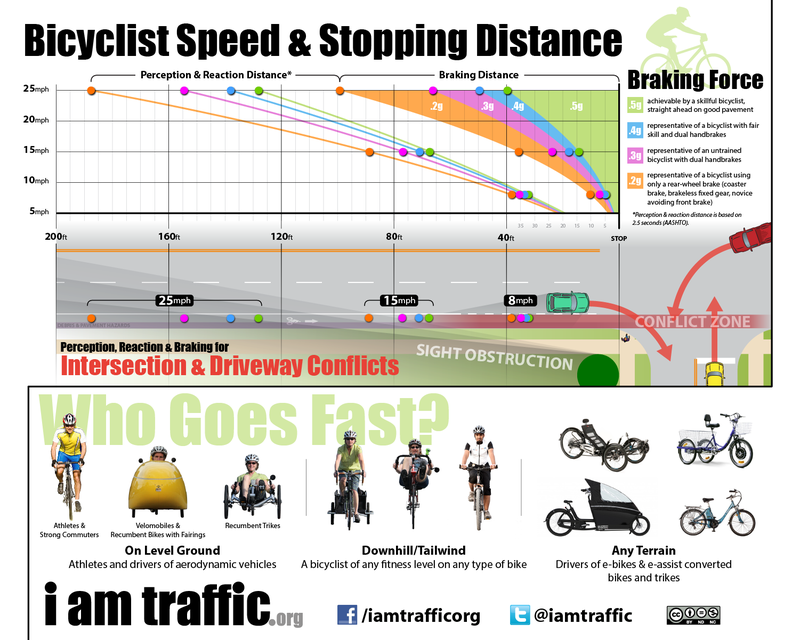 The least skilled riders suffer the most from surprise conflicts at intersections and driveways. EVERYONE IS FAST SOMETIMES Bicycle infrastructure needs to accommodate all speeds and skill levels. 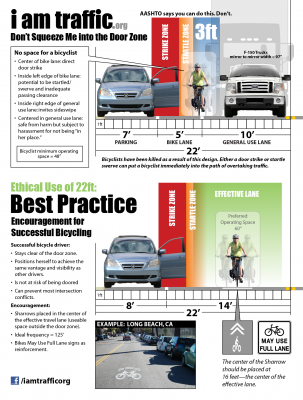 It’s a mistake to assume that fast bicyclists are highly-skilled, or that the least skilled bicyclists are always slow. 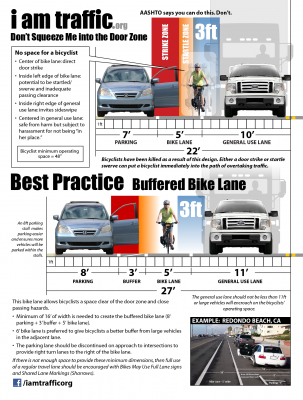 All bicyclists are fast when going downhill, which is why bike lanes should not be striped on downhill grades. 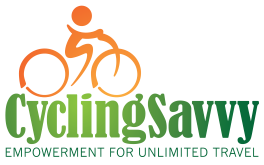 The growing popularity of e-bikes will produce an increasing number of high speed bicyclists who do not understand the conflicts of edge riding and lack the emergency handling skills to deal with them. 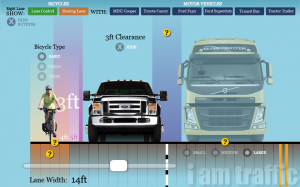 DATA NOTES: *Perception & reaction distance is based on 2.5 seconds (AASHTO). However, an uneducated/inexperienced bicyclist will have a slower reaction time than an educated/experienced bicyclist. Uneducated bicyclists are typically unaware of primary risk areas or where to direct attention. **Rear-wheel-only braking results in a skid stop. It is typical of a coaster brake bike or a brakeless fixed-gear bike. It is also common practice for novices, who are afraid of going over the handlebars, to only use the rear brake and skid. 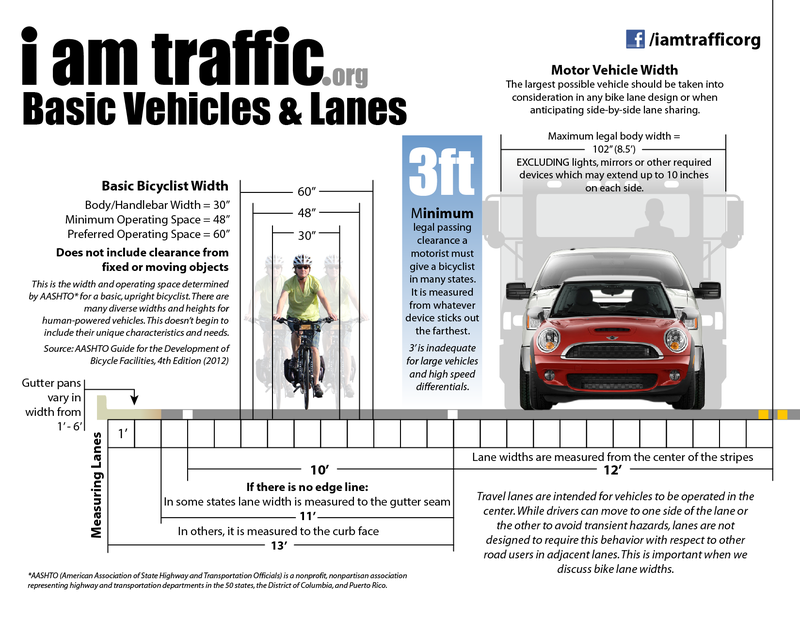 The above graphic shows why bicyclists should control — not share — a 12ft travel lane. 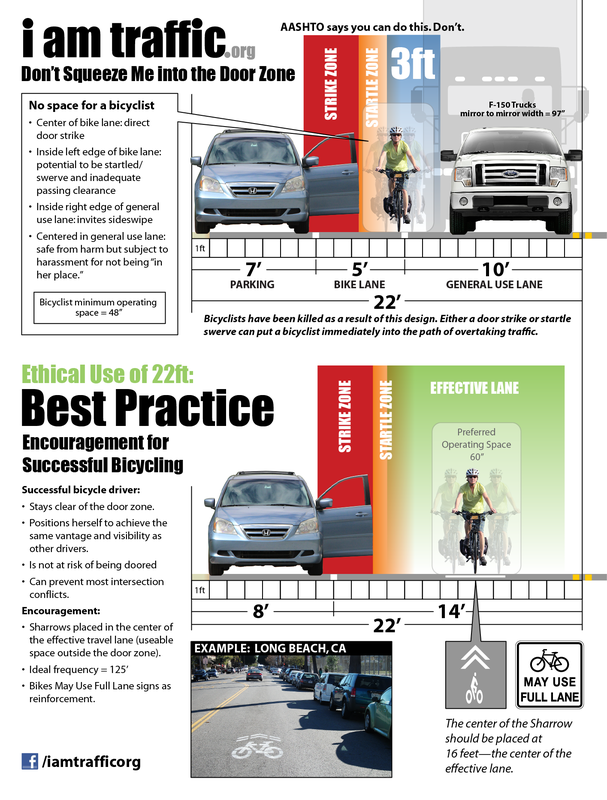 Bicyclists should never be directed to operate in a hazard zone. 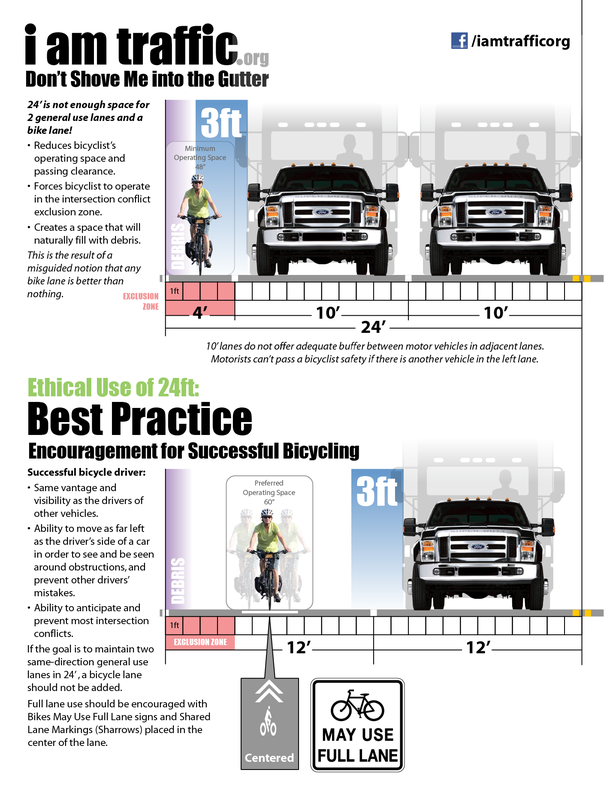 This graphic shows the best practice placement for sharrows to keep the bicyclists away from the hazard. 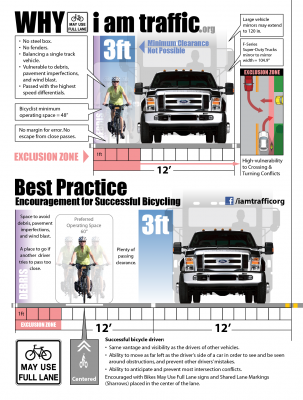 Bicyclists should never be directed to operate in a hazard zone. 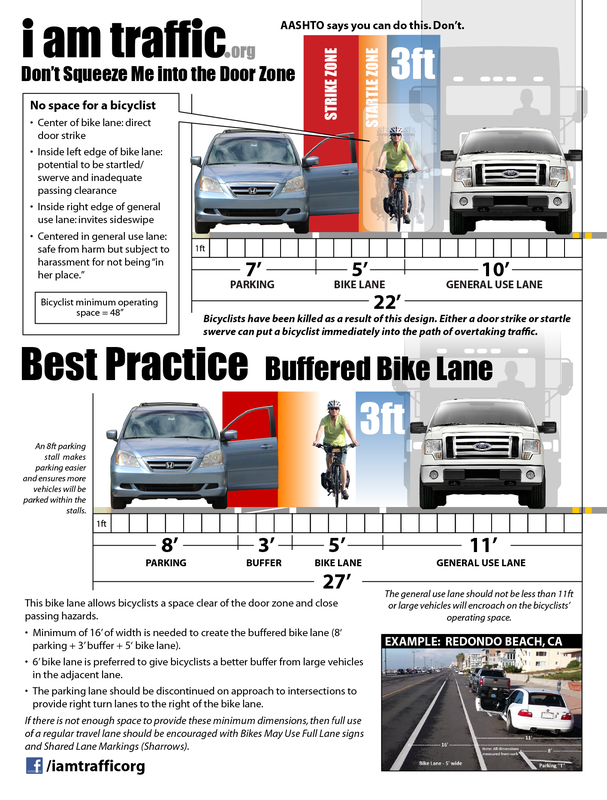 If there is space, the best practice is to create a bike lane with a buffer from the door zone. 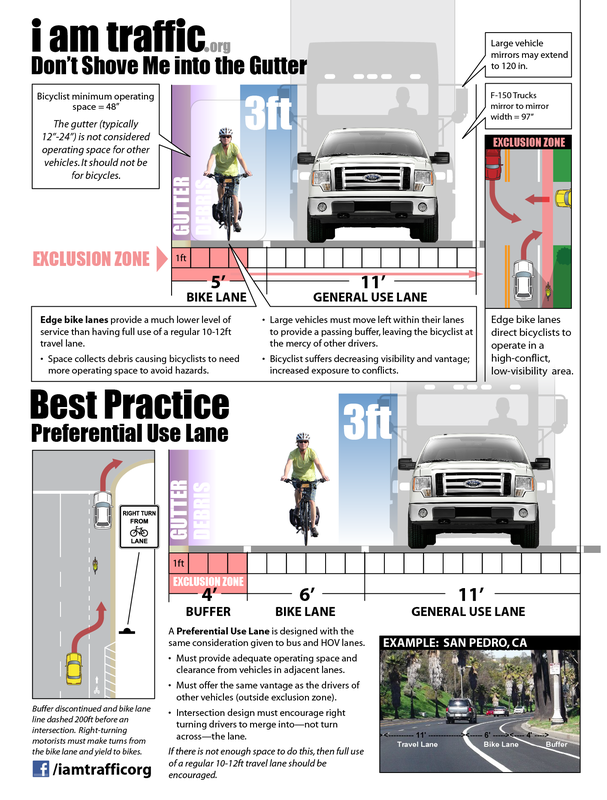 Where bike lanes are appropriate (higher speed roads with infrequent intersections or driveways) they should be designed to offer bicyclists the same operational level of service as any other preferential use lane. 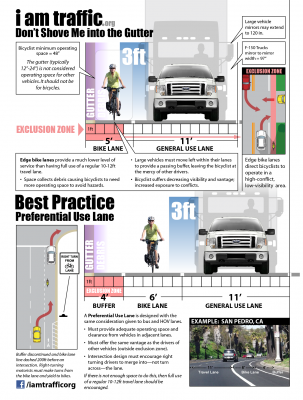 If there is not enough space to add a properly-designed bike lane, bicyclists should be encouraged to control the general use lane for their own safety. All of the above graphics are licensed under the Creative Commons Attribution-NonCommercial-NoDerivs 3.0 Unported License. You are welcome to redistribute the images as long as they are not modified and not used for commercial purposes. Please attribute the images to i am traffic, and link to http://iamtraffic.org if possible.